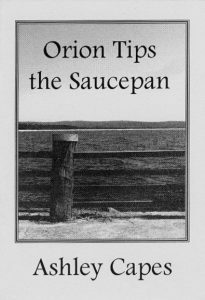 Orion Tips the Saucepan is Ashley’s first haiku collection, originally released by Picaro Press (2010) and now available here from Ginninderra Press! This collection includes haiku and senryu and includes a renku I led some time ago and which was first published in Notes from the Gean. The collection is a neat, A6-sized, 24 page chapbook, printed beautifully and available for $5 incl postage – both by contacting me here, or e-mailing me ( mountain0ash[at]gmail[dot]com ) and at the GP site via paypal.